This past weekend I had the pleasure of taking a workshop with the one and only, queen of black and white herself, Kathy King. 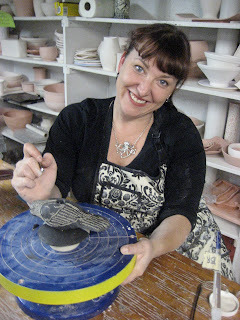 Kathy was a joy to take a workshop with, she has us laughing up a storm from the minute we walked into the room. She talked about her interest in comic books, graphic novels, drawing, and other ceramic artists. You can totally tell from her work where her interests lie. Kathy teaches at the Harvard Ceramic Studio presently, but has also taught at many other colleges and universities around the country. In addition to teaching at the university level she teaches workshops around the country at places like Penland, Haystack, Watershed, and Arrowmont. I feel very fortunate that I can call Kathy not only an awesome friend but also call her one of my mentors. I hope you enjoy some of the photos I took during the workshop. Kathy carving away at the base of the tulipiere. A robot thought bubble after she had demoed how to paint with china paint. China paint has a long history where women got together and china painted, *basically gossiped about each other. 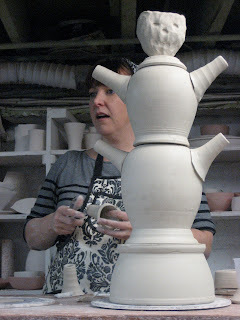 Kathy working on her tall stacked form called a tulipiere. Each of those spouts would hold flowers. 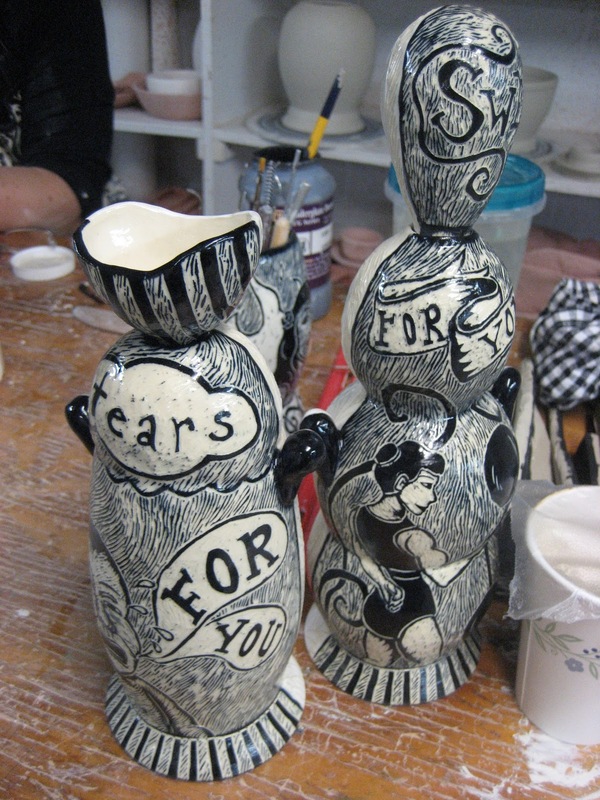 Some of Kathy's finished work for an upcoming show.